Every night is a good night for drinking and no one does it better than the wonderful people of Bombay! Am I right or am I right?! This beautifully buzzing city has so many watering holes that its almost impossible to put down all the top spots at one go, so here’s me listing down the top watering holes of the suburbs. This gorgeous looking place with one section (a very small one) devoted to swing style seating is good for weekday drinking and even better on the weekends. usually bustling with people, Copa has a fun relaxed vibe and is popular with the suburban crowd. While the drinks menu is quite extensive, the place also offers some really delicious grub. Their burgers get full marks, both the veg and the non veg variants. 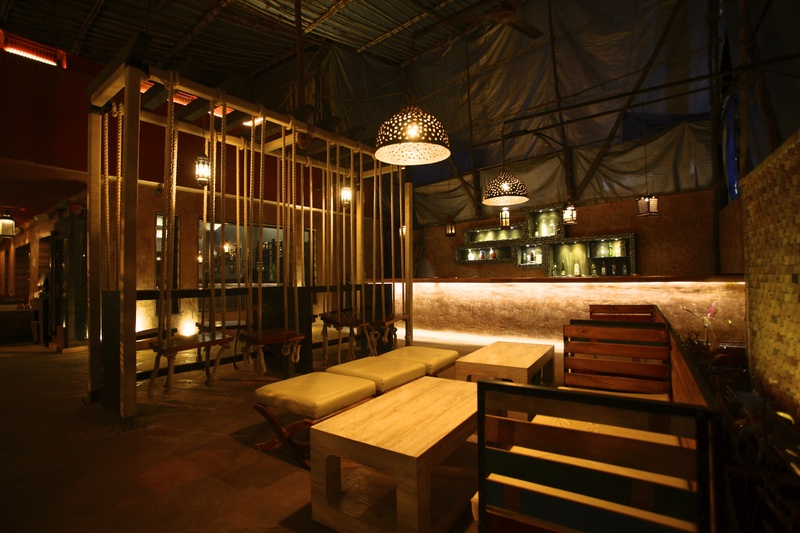 If you haven’t already, then you must check out this Juhu bar soon. Must Try: Cheese Souffle Stuffed Mushrooms, Grilled Lamb and Beer Braised Onions Burger, Watermelon Bloody Mary and Off The Street Gola. Location: Anna Building, 13th Road, Opp Juhu Gymkahana, Juhu. Fairly new with a non functional brewery (seriously can we enable the licensing faster in Bombay?!) but still manages to draw in quite a bit of crowd because the food, the ambience and the cocktails are top notch. They have quite a few beer based cocktails as well for the light drinkers. The food is beyond words here, you get Bombay’s most delicious (atleast as per me) pulled pork burgers here and some of the best wood fired pizzas you can lay your hands on. The ambience is very laid back and the pretty fairy lights in the smoking zone cut quite the picture. Sometimes all you need is cheap alcohol and a no frills place that surprisingly attracts decent crowd. An upgrade from the good old Janta Bar in Bandra, Quarter Pillar serves cheap alcohol and yes you can order by the quart. The food isn’t spectacular, but is a decent accompaniment to the alcohol. It’s a perfect place for pre-gaming in case you want to head out somewhere else later. It has a non smoking inside area as well as a smoking area with decent seating outside. Given the location, the crowd and the pretty decent ambience the price of alcohol served is very cheap and that’s why it’s a great spot to grab a few rounds with friends! Location: The Unicontinental, 3rd Road, Off SV Road, Khar. This rooftop pub has been around for quite a while and is still going strong, thanks to the ambience and the live acts that take place here almost every week. Great for any day of the week, this small place is usually packed to the brim during live gigs. A buzzing ambience, good service and a nice selection of food and drinks definitely goes to prove why this place is still giving the new places a run for their money. Must haves include the Fish & Chips, Chicken Sliders and Jagerbombs! Location: 2nd Floor, Kenilworth, Linking Road, Bandra. BSE or The Bar Stock Exchange successfully made use of the bidding and drinking concept with an app that allows you to place your orders directly from your phone. The alcohol prices keep fluctuating throughout the night basis the demand and supply and if used smartly one can end up ordering otherwise pricey alcohol for dirt cheap prices. Ambience is great, and it has both indoor and outdoor seating. The food isn’t too bad either. A good place to grab a few drinks on any day of the week, BSE has managed to attract a large number of customers with its unique concept. Foodwise do try the Potato Wedges and Hummus Platter, avoid the Paella. Do keep note that entry isnt allowed for anyone below the age of 24. Location: 1st Floor, Equinox Business Park, BKC. ← 5 completely unconventional ways to use BACON in your food! !